Indiana allows students to earn dual credit in academic and/or CTE dual-enrollment courses through dual credit, concurrent enrollment, and postsecondary enrollment programs offered at their high school, postsecondary institution, online, or via another method. Public postsecondary institutions are required to accept these credits (Education Commission of the States, 2015). The Gateway to College National Network established one Early College High School as part of the Early College High School Initiative (ECHSI). More information about schools participating in ECHSI is available at the ECHSI website (Jobs for the Future, n.d.). In 2008, Indiana mandated that all students in Grades 6–12 have a High School Graduation Plan (HSGP) (U.S. Department of Labor, 2013). An HSGP includes a commitment to finishing high school beginning in the sixth grade, the courses needed to graduate, ISTEP+ and End-of-Course Assessment scores, and SAT and/or ACT scores. The HSGP is developed and revised annually by the student and counselor and must be signed by parents or legal guardians (Indiana Commission for Higher Education, n.d.). 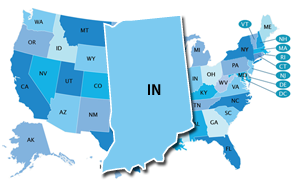 The Indiana General Assembly made Core 40 the minimum college admission requirement for the state’s public four-year universities beginning in the fall of 2011. Indiana’s Early Warning System includes the number of ninth graders who fail to earn enough credits for promotion to the 10th grade on their school’s report card. Early Warning System data are reported at the student level. It is not publicity available who can access the Early Warning System data.